The leg north up the Atlantic is one that is often underestimated with the presumption of it being a lighter wind affair compared to the previous ravages of the Southern Ocean. However the northerly slog up the coast of Brazil, upwind against the Trades, can be a boat breaker and famously caused Chris Dickson's race leader Tokio to dismast in the 1993-4 race, costing her the race. At present the South Atlantic is slightly fuller of areas of high pressure than normal. The reason for the light start on Sunday was due to one residing over southern Brazil. This the VO65s are currently sailing away from but away to their east is a more conventionally positioned high and it is this that is generating the building northeasterly trades. To make the best of this the boats are currently heading east, having tacked more or less as one at midnight UTC on Sunday-Monday. This tack has since determined the position of the boats across the race course with Dongfeng Race Team and Team SCA tacking first and taking up the southerly berth. However it is MAPFRE, with Xabi Fernandez back in charge, that was the last to tack and has slowly eased ahead. DTF means little at present but in the flight east MAPFRE is around 1.8 miles ahead of Team SCA, neck and neck with Dongfeng Race Team and Team Alvimedica. Over the next 48 hours the high over Brazil is set to ease east out to sea causing the wind to back into the north and then the NNW. The shortest route north is to hug the Brazilian coast line but to make the best of the shifts it is likely that the boats will head into the west side of the main area of high pressure and to use the shift to the northeast to tack to the NNW. Never has sailing in a straight line been so tedious. Like a group of children all running towards an invisible chocolate bar in the east, we watch each other for any flinch, any slight change in course that would upset the group. The herd mentality, that’s what we’re calling it. With minute details defining gains and losses, all of our different personalities are coming out – some are behaving, some are stirring up trouble. Alvimedica has been on the naughty list today. Gradually, they worked their way up to our line all morning sitting just over a half mile ahead – close enough to throw disturbed air off their sails and hurt our boat speed. Aggressively, Ian has spent most of his waking minutes (and also hasn’t gotten much sleep) running between the AIS in the nav station and jumping on deck trying to break their stranglehold. If they sail higher, we’ll sail lower. If they sail lower, we’ll pinch to get away from their bad air. On and on the vicious game continues. Every move we make they’re meeting with a countermove. One on one you could call it match racing. However in the middle of the herd, you call it slow – for both of us. At one point, Ian was so confused by what Alvimedica was trying to do he joked about calling Charlie on the VHF – offshore sailing’s equivalent of rolling down the window and yelling at the driver in front of you. Like a procession of 6 weather vanes all pointing deeper into the Atlantic Ocean, you can be on deck and almost look straight down the line of sails. When a gust hits the first silhouette you can count the seconds until it hits the next. The subtlety of different sail plans the only thing keeping it interesting. SCA is not using their FRO at all due to the damage it sustained in Leg 5. They’re compensating for bigger breeze with reefs in their Main. 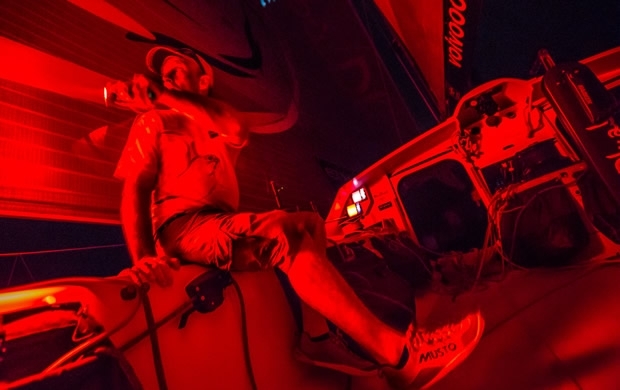 Dongfeng characteristically is favoring a larger sail plan. Mapfre has been using a jib all afternoon. Different answers to the same problem – life in the herd. We would unanimously agree that Seb’s attitude has never waivered or been in question. He’s an absolute workhorse who we’re all really happy to have back. He’s like the kid in class who puts his hand up for every question and always sits in the front row. He is always analyzing everything, trying to be better [and making everyone around him better in the process]. Stu Bannatyne was an excellent addition to the team for Leg 5 and we learned heaps from having his experience along for the Southern Ocean, but now we’re back to our starting roster and it feels really good to again have the Frenchman onboard, regardless of how little he says we can actually understand. In fact, it took all of about 24 hours for Seb to find something to repair. He is our primary rigger, a job he has been learning since the beginning of the race, and when we ripped the cover off of our tack line during an inline peel this morning (Masthead Zero to the smaller Fractional Zero), it was Seb who spent six hours fixing it. Last I saw him he was still on deck working under red headlamp, pushing a rusty needle through the frayed line with every bit of precision as when he started. And as the race east continues with the fleet well within sight of each other it’s going to be Seb’s freshness that will make the difference. This is going to be another long 20-plus day leg and there’s a very good chance fatigue will play an important role. He’s rested, refreshed, and psyched to be sailing, and it’s only a matter of time before Seb finds his rhythm again. Maybe by then he’ll know how to pronounce it, too!